The record industry has seen a lot of change over the years. 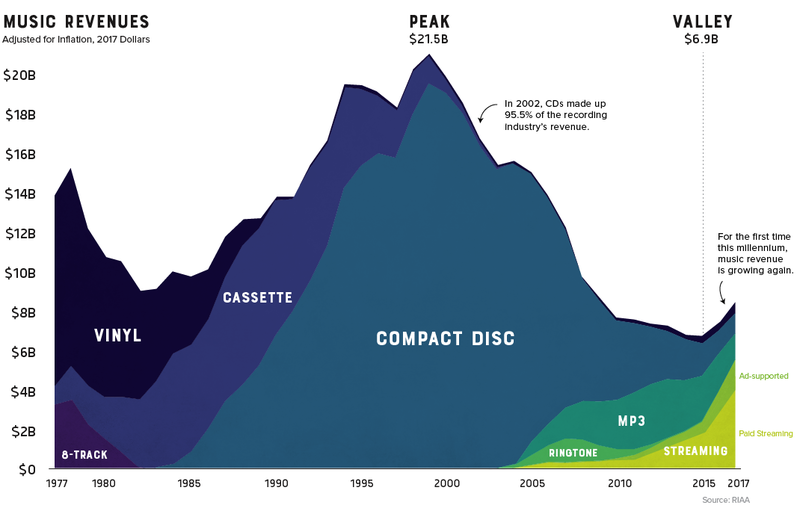 Vinyl gave way to 8-tracks, and cassettes faded away as compact discs took the world by storm, and through it all, the music industry saw its revenue continue to climb. That is, until it was digitally disrupted. Looking back at four decades of music industry sales data is a fascinating exercise as it charts not only the rise and fall the record company profits, but seismic shifts in technology and consumer behavior as well. For people of a certain age group, early memories of acquiring new music are inexorably linked to piracy. Going to the store and purchasing a $20 disc wasn’t even a part of the thought process. 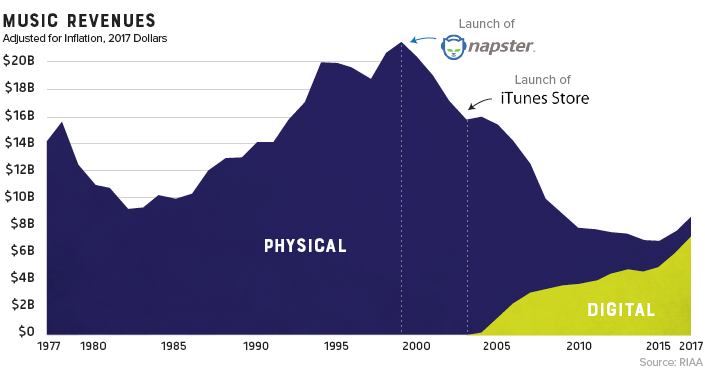 Napster, the first widely used P2P service, figuratively skipped the needle off the record and ended years of impressive profitability in the recording industry. Napster was shut down in 2002, but the genie was already out of the bottle. Piracy’s effect on the industry was immediate and stark. Music industry sales, which had been experiencing impressive year-over-year growth, began a decline that would continue for 15 years. While acquiring music was as easy opening Limewire on your desktop computer, transferring that new T-Pain track to a flip-phone wasn’t a seamless experience. This brief gap in technology – before smartphones hit mass adoption – brought us the ringtone era. Distribution was controlled by mobile carriers, so ringtones were a comfortable gateway for the record industry to get a taste for digital-based revenue. In 2008 alone, they injected over a billion dollars of revenue into an industry that was getting used to gloomy forecasts. Though services like Spotify and Pandora haven’t replaced the money pipeline that CD sales provided, they have reversed the industry’s tailspin. For the first time this millennium, record industry posted an increase in revenue for two consecutive years (and likely a third in 2018). It took a while for consumers to warm up to paying for a premium music subscription, but today, there’s a solid basis for optimism. Music streaming is now the most common format for music in the United States, and the RIAA reports that streaming now makes up nearly half of the market. The End of Physical Format? Gone are the days when people would line up at the music shop for a hot new release. In fact, CD sales are down 80% in the past decade. Today, physical format sales only account for 17% of the industry’s revenue. There is, however, one bright spot in physical format segment: vinyl. In 2017, vinyl sales hit 25-year high after making a slow and steady comeback. Vinyl is written in stone. I think if it’s made it for 120 years now, it’s here forever.